Cat’s paw pads are important parts of cat which functions as shock absorber, balance, and walking. Cat naturally have tough and hard paw pads, but they are sensitive and regularly exposed to things that can be damaging for cat. There are many issue that can affect cat’s paw pads. Irritation from rough surfaces, thermal or chemical burns, environmental allergies or food allergy can make change to paw pads. One of the issues is cracked paw pads. There are many causes of cracked paw pads, such as freezing patios, hot walk surfaces, or other irritating surface the cat walked on. The paw pads can peel or crack. If we notice that you cat has cracked paw pads, then we may need to offer some cares for your cat. To give the cat paw’s care, then firstly we need to make the cat let us handle its paws. To do it, it’s the best to start it when it is still kitten so it will get used over the time. To handle cat’s paws, we can start by making the cat feels comfortable, place it on our laps, pet it and make it relax. After the cat relax, gently touch the paws, you can start by the top of the paws. Don’t force the cat if it doesn’t want you to touch its paws. Try to do that regularly when the cat is comfortable, so the cat can get used to it. Don’t forget to give the cat some treats after that, to appreciate it. It is also important for cat owner to check cat’s paws regularly, to notice if there is any change or injury in the paws. We can do the check every time we are grooming the cat. Trim cat’s nails, massage, and wipe cat’s paws regularly to keep it healthy and clean. We also need to regularly wipe the cat’s paws, especially for outdoor cat, as it can become sick from licking harmful substances from its paws. If the cat suffers from cracked paw pads, it is important to give it some treatment and care. Remember that cat is natural groomer so anything we put on its paws will ended up licked by the cat. That’s why it is important for us to use products which are safe if ingested by cat. So here’s some steps how to deal with cracked paw pads in cats. Cat paw pads are great organs to prevent puncture wounds, but they are vulnerable to extreme temperatures. They are extremely sensitive to hot and cold temperatures and can become dry and cracked because of that. So it is important to moisturize cat’s paw pads, especially in the high and low temperatures seasons such as winter and summer. A dry paw pads can also cause crack in the paw pads so it is important for cat owner to keep the moisture of cat’s paws. To moisturize the cat’s paw pads, we can use fast absorbing and penetrating emollient like Vaseline. Massage the Vaseline to the paw pads, two or three times a week. The cat may sense that there is something on its paw and start to lick it, but it is fine since Vaseline is safe to be ingested by the cat. Another product you can use to moisturize the paw pad is olive oil. There are few things we cannot give to moisturize cat’s paw pads, such as cortisone cream and tea tree oil. These products are dangerous to ingest by the cat as they are bad for cat’s liver and other organs. It is recommended to talk with the vet first to use any moisturizer and how to deal with cracked paw pads in cat. You can also give supplements, such as fish oil or flax seed, to help the cat’s body to moisture its paw pads. Also remember to keep the cats hydrated by drinking enough water daily. Nutrition deficiencies, such as low protein and fatty acid deficiency, can also cause cracked paw pads. To give the cats supplement, you need to first consult it with the vet, to know the right dose, use and if it is safe for the cat. Herbal supplements may be harmful for cat as it can cause organ damage. Since cracked paw pads can be caused by extreme temperature, it is important for cat owner to protect the cat from extreme environment. Keep the cat away from harmful surfaces, such as concrete in hot summer or cold winter. There will be a temperature extreme which can harm the cat’s paw pads if the cat walks on it. We also need to keep the hair around the cat’s paw pads short in the winter. The long hair could collect snow and ice on it. The sharp ice crystal can also damage the paw pads. If the cat’s paw pads are heavily cracked, dry, and even painful for the cat, you need to go check your cat to the vet. The dry and cracked paws may be the sign of other health issues, such as diabetes, digestion issue, or even cancer. To prevent unwanted problem for the cat, it is better to let the vet check them. If the cat doesn’t have other health issue, then you can ask the vet how to deal with cracked paw pads in cat and treat your cat. The cat paw pads are sensitive parts which contain many nerve ends and act as a sensory organ for cat. Any issue on paw pads can cause trouble for cat, from discomfort to pain for walking. 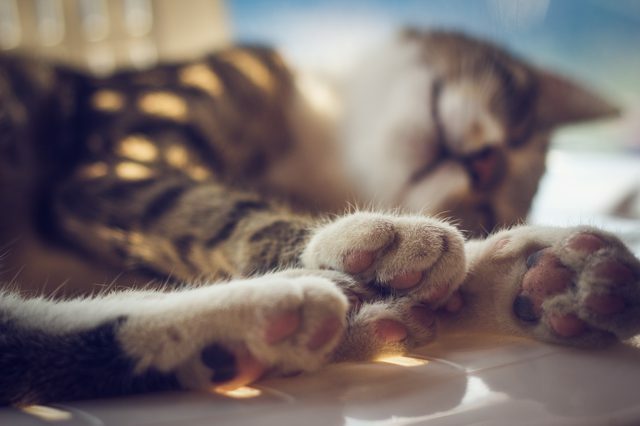 Cracked paw pads can also mean that the cat has been exposed with harmful environment, and can also be a sign of more severe health condition such as plasma cell pododermatitis or even cancer. It is important for cat owner to understand how to deal with cracked paw pads on cat and to prevent it to happen in the future.